At daybreak two troops of the Commando, plus TAC HQ, to which Pte Calder in the capacity of medical orderly was attached, found themselves on the tip of a narrow dyke with impassable mud and water on either side. From one flank they were subjected to intense and accurate artillery and mortar fire; and from the other they were under close and accurate small arms and sniper's fire. Within a few minutes eight officers men were killed or seriously wounded, and one of the troop medical orderlies who had tried to reach them was forced to take cover in the swampy grass. At this stage Pte. Calder crawled forward, and when all cover gave out, he tied some white bandage round one arm, in lieu of his Geneva Cross which he had lost, and advanced in the open. He was followed by Sgt. Bostock, RAMC, who witnessed the next incident. Calder was now so close to the enemy position, that a German NCO, thinking he wished to surrender, came out and signalled to him to come in; Calder somehow managed to make him understand that he intended to look after the Casualties: the German politely agreed and returned to his strongpoint. Calder and Sgt Bostock evacuated the only surviving casualty successfully. Throughout the next three hours Calder left his slit-trench repeatedly to deal with other casualties as they occurred: during which time he had repeated narrow escapes. As soon as the enemy strongpoint in the pumping-station was captured, Pte Calder advanced entirely on his own iniative to help with casualties there. It now became known that the troop that had advanced to the canal bridge (our main objective) had been attacked from both sides by the enemy, supported by two S.P. guns, and had been wiped out. Without a word to anyone Pte. Calder set off alone down another dyke which was completely devoid of cover and subjected to heavy fire of all kinds. He swam a gap through which flood water was pouring, which had been deemed impassable to troops, and near the bridge found the bodies of the medical orderly and other members of the missing Troop. Although he was now half a mile in advance of the Commando's most forward position, he pushed on beyond the bridge. Here he found two seriously wounded men of the Commando, one of them lying in the water. He did what he could for them and then pushed on half a mile further through still uncaptured territory until he found a stretcher party of the 2/5 Queen's in Menate village. He led these back to rescue the two wounded men, and then returned alone to our positions. Throughout the whole day he continued to display a complete indifference to danger and a cheerful stoicism that was most remarkable. His behaviour was an outstanding display of the most exceptional initiative and courage with which he is endowed, and which he has shown on several previous operations. In Commando Association newsletter no. 15 issued September 1952 there is an entry as follows: Pte. H. W. Calder, DCM, of the R.A.M.C. (40 and 45 Cdos) is being treated reasonably well in captivity and is being allowed to carry on with his medical work. His Mother thanks members for their kind enquiries. In September 1973 H.W. 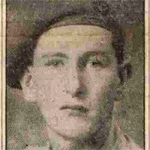 Calder DCM (40 and 45 Cdos) from Peterhead Aberdeenshire is named in Commando Association Lost Legion List no. 3 (members they had lost contact with). Citation from National Archives WO/373/14 . Aberdeen Evening Express report published Saturday 22nd September 1951 posted on CVA Forum. 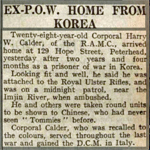 The Dundee Courier report on his return home published 16th Oct. 1953.